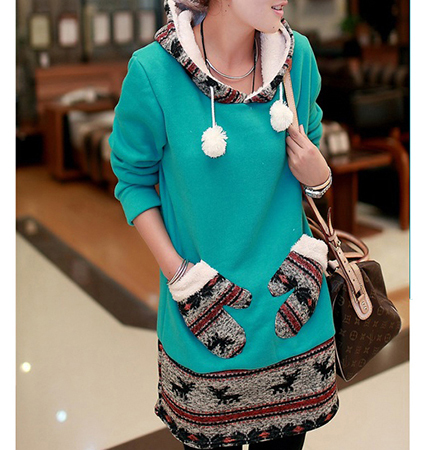 This sweatshirt tunic for women is a soft, comfortable way to spend those chilly days of winter. It is presented in a lovely shade of sea green with a reindeer-themed border at the bottom. It includes a cute pair of matching mittens in the same theme. That theme also appears in the fabric that comprises the attached hood. The hood has a white drawstring that has two pom poms on the ends. The length of this tunic extends well below the hips. It has long sleeves with knit ribbing at the ends. This garment is machine washable in warm water and may be tumbled dry. It is available in sizes Medium, Large and Extra Large.